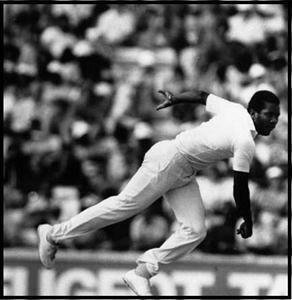 Malcolm Marshall is a former West Indian cricketer regarded as one of the greatest fast bowler the game has seen. Marshall has the Test record of best bowling average (20.94) by any bowler who has taken 200 or more wickets in Tests. A dangerous fast bowler he is also a very dangerous lower order batsman and had played many good innings in his career. 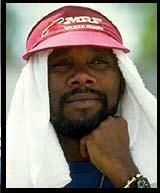 Malcolm Marshall was born on 18 April, 1958 at Bridgetown (Barbados). He died at the age of 41 from cancer in 1999 at his hometown Bridgetown. Malcolm Marshall made his first-class debut in a match against Jamaica for Barbados in 1978. His figures in the Jamaica's first innings were 6/77. Durind the 1978-79 tour of India he was selected in the West Indies team as many senior players were not available. He made his Test debut in the second test at Bangalore and took only one wicket in the match. He was again failed to impress in the third test of the six-match series and was dropped from the fourth and fifth match of the series. For 1979 season he played for Hampshire in county cricket. In 1980 during the England tour, Marshall showed excellent bowling in the third test at Old Trafford. His bowling figure of 7/24 started the collapse of the England innings in that match. During the 1983-84 tour of India he took 33 wickets in the test series. He also made his highest test score of 92 in that series. From 1984 to 1988, he was successful against every team. His best bowling figure in Test came against England at Old Trafford in 1988 where he took 7 for 22 in an innings. His last test was against England at The Oval in 1991. Marshall is also known for his contribution with the bat. He was an aggressive batsman. In his first class career he had made seven centuries and a very good batting average of 24.83 which is great for a lower order batsman. 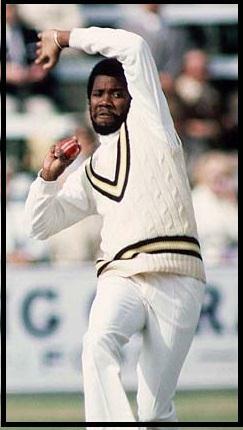 Malcolm Marshall was also a very dangerous bowler in One Day Internationals. He played in the two World Cups - 1983 and 1992. He was very economical bowler in ODI cricket with a Economy Rate of 3.53.